Bronwen experienced two distinct near death experiences (NDE), separated by approximately three months. The first was the result of a head injury and the second was a spontaneous occurrence at a New Year’s Eve party. Her feeling of joy and love during those episodes was remarkable. Read More. Diego had an extremely varied near death experience. While many have an out-of-body episode, that seemed to only cover one aspect of their life, such as meeting past family, a life review, or speaking to a high spirit; Diego’s NDE was a tour-de-force, commencing with a life review, a glimpse at the process of spirits traveling back and forth to earth and the newly departed journeying upwards. He conversed with a high spirit and was shown personal future events … and what is most startling; allowed to retain memories of what was revealed. Read More. Joanna has lived with chronic pain for many years, since her daughter was small. Disabilities so great, that constant agony precluded her ever holding a job. Only the need of raising her only child kept her alive. She planned to end her torturous existence as soon as her daughter was grown and out in the world on her own two feet … until at the age of thirty-seven she had a heart attack. Read More. David was an angry young man. He was mad at God because he was gay and a multitude of other reasons. He had lived in Hawaii, but was now stateside in the East Bay area of California. He had traveled on his first skiing trip and came back with walking pneumonia. That night, all alone in the house he would experience purgatory and be rescued to glimpse a slice of heaven. Read More. 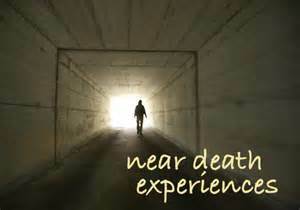 There are many NDE (near death experiences) stories around the internet. I thought it may be useful for people if I took some of the more interesting recollections and provided what they mean seen through the context of the Spiritist Doctrine. Please note, these are my interpretations, and other Spiritists may have different or even better explanations. Explore the Section.